I recently conducted an interview with author Chris Barez Brown about his book entitled ” Wake-Up“–Podcast # 645. 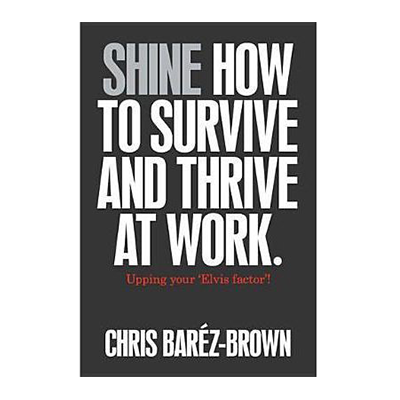 I had such a great experience and interview with Chris that I invited him back to speak about his new book entitled “Shine, How To Survive And Thrive At Work“. We all spend a lot of time at our work, so having fun and enjoying our work is so important to remain engaged. In my interview with Chris, we discuss the many great ideas about how to keep our work fun and stay engaged. Just one of the ideas includes a concept he calls “Who’s Elvis Around Here?” This is really a great idea, and is the person who stands out in your business, the one that breaks the rules, and makes things happen within the organization. Is that you our are you just standing by waiting, or afraid to speak up? Don’t stand on the sidelines waiting, get engaged and speak up with your good ideas to propel the business forward. Chris states that our minds are highly efficient killing machines. They are trained from an early age to destroy anything that doesn’t fit our model of the world. This means that analytical, logical minds dominate our working lives–what are you doing to get off or autopilot and tap into your abundant thinking brain which breaks the cycle of helping us to consider futures that are not based on past experience? Shine, How to Survive and Thrive at Work is a book loaded with great ideas to help you thrive in the workplace. It is an easy read and should be the companion to anyone wanting to make a difference at work. If you want more information about author Chris Barez-Brown please click here to be taken to his website. Our your can click here to be directed to Chris’s Facebook page. I hope you enjoy this great interview with someone who has transformed how organizations look at their employees.